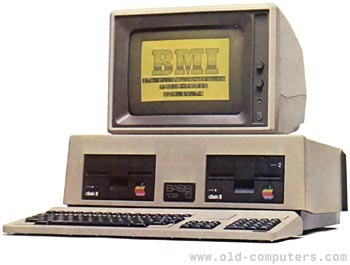 This professional computer was compatible with most of the hardware and software designed for the Apple II. It could run under DOS 3.x, but thanks to its second CPU, a Z80 processor, it could also run under CP/M. The Basis 108 had 128 KB RAM, (two switchable memory banks of 64k). Two 5"1/4 disk-drives (Apple compatible) could also be mounted inside the computer. In the picture, these are Apple Disk II drives. A year after introduction, the Basis Junior was presented at various different electronic shows. It was basically the same computer but with only 64 KB RAM (with optional expansion to 128k). see more Basis BASIS 108 Ebay auctions !